2018 is not yet through the month of April, but as anticipated, Bryce Harper is already the story which is dominating Washington Nationals news. The volume of Harper news will only pick up as we move through the summer months and into October and the first few days after baseball wraps up the post-season and Bryce Harper officially becomes a free agent — it will move to a fever pitch. The Nats are facing a decision which will define the franchise for years to come. While there are extremely strong and passionate feelings on either side of the equation — make no mistake about it — this is an extremely complicated set of decisions for the organization and the direction to take is not straightforward or obvious. As a starting point, let’s put all of the cards on the table which are not debatable unless you have already made up your mind and aren’t willing to consider all of the aspects in a balanced manner. Bryce Harper is not only the Nationals best hitter by a wide margin, he is also the face of the franchise as well as the face of baseball. His brand is huge, and he is really the only recognizable Nats player to the casual fan and to those who aren’t fans as he has transcended into pop culture. The Nats without Harper will be a very different team. This is not a value judgment, it’s a fact. In addition, Bryce is only 25 years old and there is good reason to expect even better production from him through his peak years. Movements of players like Bryce Harper are major events in a Lebron James kind of way. The thought of losing a generational type of player and personality like Harper is something you don’t take lightly. The other side of the equation is not without merit either. Harper would command a very large percentage of the Nats payroll and would undoubtedly hamper the Nats ability to sign other high-priced player such as Anthony Rendon, a super star in his own way on the verge of a free agent year, and Trea Turner a couple of years after that. In addition, the Nats have some significant holes in their starting rotation and there likely isn’t a cheap way to plug these holes. Letting Harper walk would give the Nats the payroll flexibility they would need to keep their championship window open. Further consideration is that there are 2 potential superstar players motoring their way through the minors and bringing them to DC gives you years of control and payroll relief as you take advantage of pre-arbitration minimum MLB salaries. So what to do? As I considered everything, my initial instinct is players like Harper come along very rarely and you do what you can to hold on to them and then you adjust your other plans accordingly. I am not sure that this isn’t the way to go assuming signing him is even possible because many teams will be bidding for Harper especially teams that need to fill half empty stadiums. But something new has crept into the equation this year. Bryce has essentially punted defense and base running in what appears to be (this is just an observation and I could be wrong) a total focus to avoid injury at all cost going into free agency. The problem is the Nats intend to compete for a championship and they are paying Harper $21.6 Million for 2018 and his play this year on the field and on the basses has quite frankly been unseemly. Bryce Harper has said he will not discuss his future beyond this season which was a good strategy so the media has tried to ask someone who will answer the question. 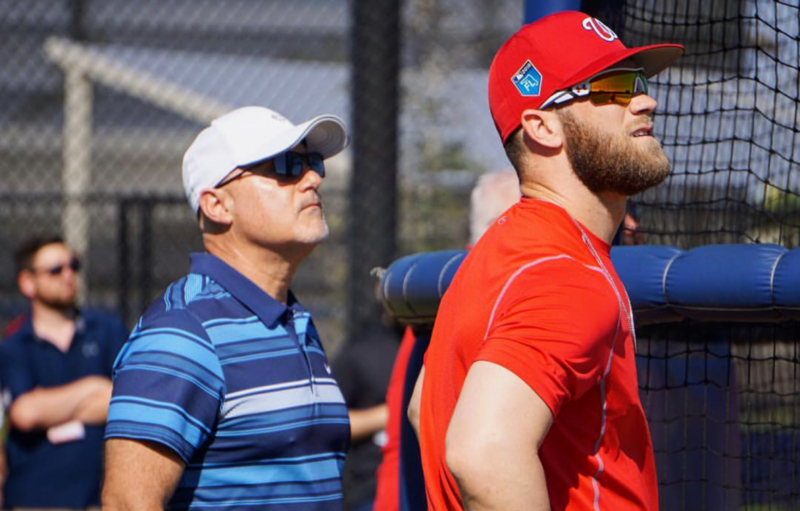 If you ask the man who speaks for the organization, general manager Mike Rizzo has a boilerplate response about Harper’s future. I guess in an effort not to sit on the fence and to present something of an opinion, I think that overall, taking everything into account, letting Harper go may well be the best solution and approach for the Washington Nationals going forward. They may have arrived at that conclusion already (just my hunch) but they will put their best foot forward and show an effort to their fans to sign him. This will be quite the drama to follow as the months turn. This entry was posted in Feature, Harper, Lerners, MikeRizzo. Bookmark the permalink.